4 Bedroom Semi Detached House For Sale in Woking for Guide Price £630,000. An extended four double bedroom, two reception semi detached home with advantage of a utility room, garage and WC. Having been with the current owner for in-excess of forty years and extended twice, this is an opportunity to acquire a much loved home set within the heart of Pyrford. In the 13'9 x 119 main living room there is an electric fire as a focal point and front aspect including open through access into the rear dining room which has views/direct access to the patio/garden via sliding doors. The property is in need of some updating however has very recently been painted inside and out to offer a fresh natural dcor, now a blank canvass for a new buyer to put down their own mark. To compliment this appealing position/location there are outside mature front/rear gardens including parking for several vehicles and a secure side gate. The rear garden is mostly lawn with an easterly aspect and steps down from the patio area offering a total depth of 47ft and width of 44ft. 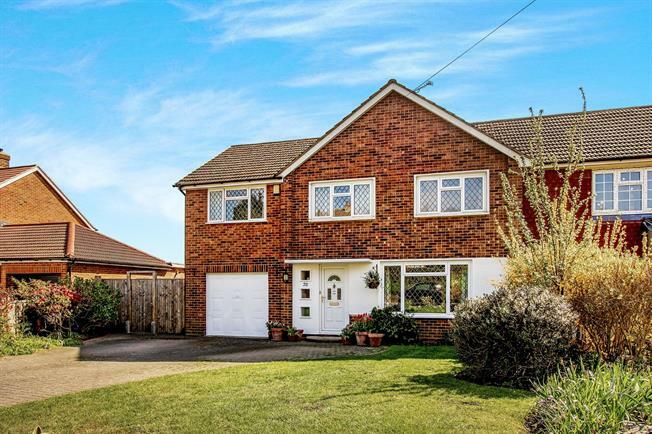 Locally there are the Pyrford shops (within a half mile) and for families, Pyrford junior school (rated as outstanding in 2013) in catchment and accessible within three hundred metres to the end of Peatmore Avenue. Within a mile (taking the Pyrford Road) there is access to West Byfleet where there is a Waitrose food store, NHS/private health centre and other retail/service outlets, whilst for the commuter there is the mainline train station with direct line services into London Waterloo circa 30-35 minutes. For the active there is a private health club (with swimming and tennis facilities) located just off the Pyrford Road..